Steve and Vanita were married in July and decided to entertain their wedding guests with something a little different on their wedding day – a gorgeous wedding newspaper favour! The couple had their hearts set on a wedding newspaper since seeing them at a friend’s wedding a few months before. 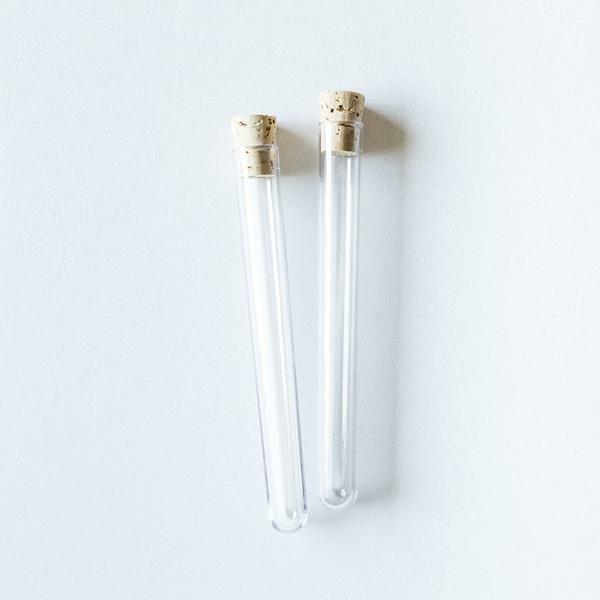 “When I first saw the wedding newspaper favours at my friend’s wedding, I thought they were absolutely amazing! I decided then and there that the newspaper favour HAD to be a part of our special day,” says bride, Vanita. 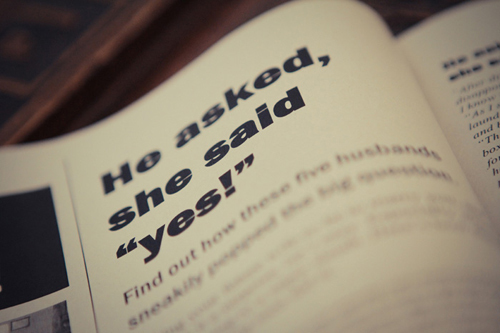 Vanita soon contacted the wedding newspaper specialists at NewsFavor.com to craft a dazzling 4-paged wedding newspaper for their big day. The couple decided whom they wanted to include in the newspaper, and NewsFavor.com took care of the rest. 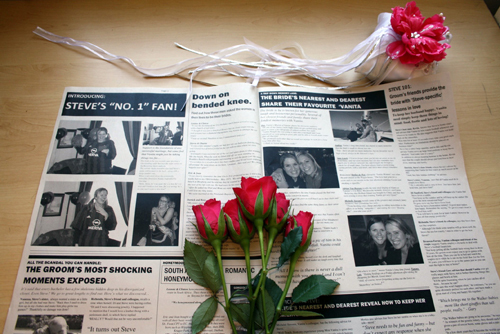 The finished product was an elegant A3 newspaper printed on high-quality newsprint paper, filled with delightful articles about the couple and their loved ones. “The newspaper captured our fondest memories and most special occasions in a beautiful, real and sincere way,” says Vanita. 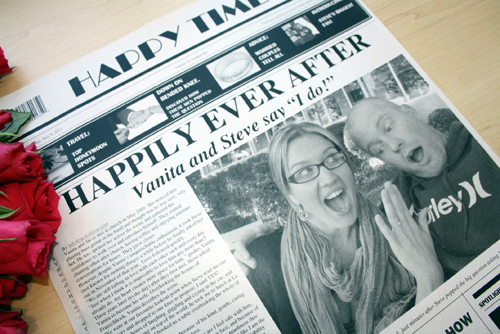 The front page feature, entitled “Happily Ever After”, captured Steve and Vanita’s love story starting from the day they first met, straight through to their engagement. Don’t you just love the fun front page headline photograph of the couple on the day that Steve proposed? The rest of the newspaper articles, all written by NewsFavor.com, included amusing but endearing advice for a long and happy marriage from the couple’s parents, family and married friends. 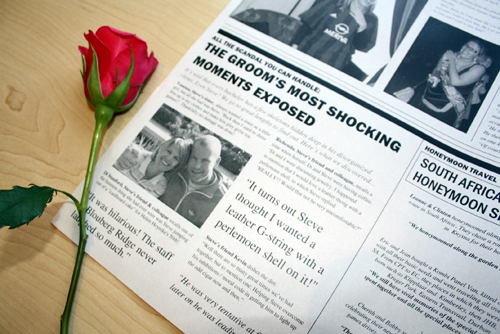 Steve and Vanita’s wedding newspaper favour cleverly incorporated photographs from the couple’s bachelor and bachelorette parties. There were even a few fun snaps from Vanita’s kitchen tea included. The wedding newspaper’s honeymoon section covered local romantic travel destinations previously visited by the couples loved ones – so cute! 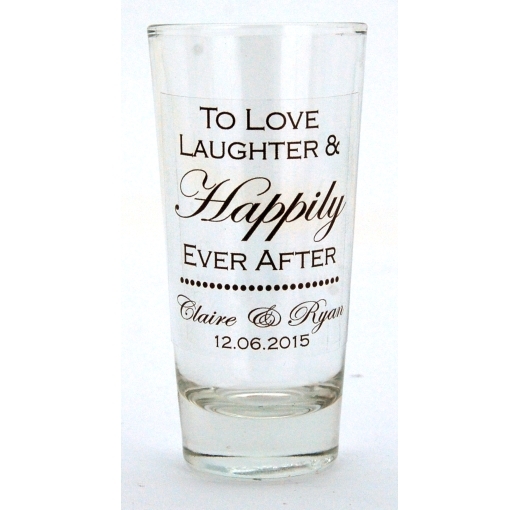 The favour also included snippets from friend’s sharing their favourite memories of the pair. 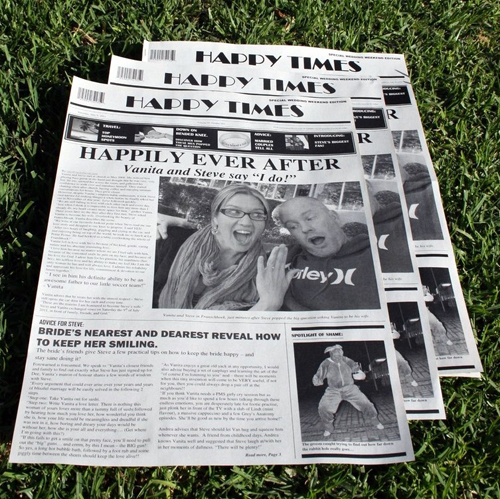 On the big day, the “Happy Times” newspaper was handed out to guests by bridesmaids during the reception, while guests awaited the couple’s grand entrance. Shrieks of delight could be heard throughout the reception venue as loved ones received their one-of-a-kind favour. The couple sent newspapers to the overseas friends and family of theirs that were not able to travel to the wedding. “I really was so proud of the favour. It warmed my heart to know that the family and friends who live far away and couldn’t join us, were able to still share our special day. 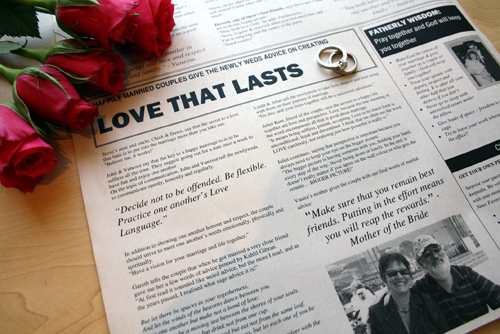 We were lucky enough to still let them feel part of our wedding by sending them their wedding newspapers,” says Vanita. “Our wedding was amazing, the best day of our lives! We enjoyed it so much, but it went by in a flash! We wanted it to last forever, but sadly the day had to come to an end. 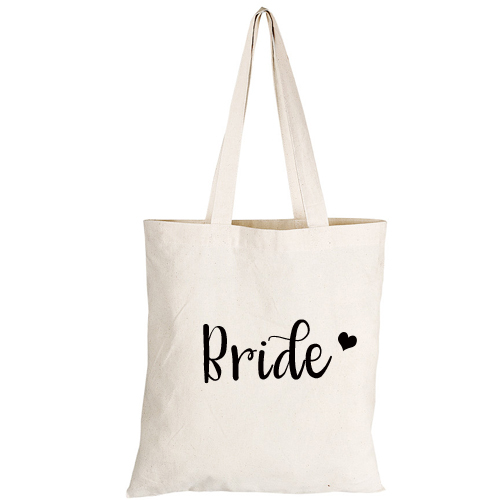 However, every time I look at our adorable wedding newspaper, it takes me back to the wedding day and the memories stay so fresh and alive in our minds,” says Vanita. Today, Vanita and Steve have framed their wedding newspaper, proudly displayed in their new home as a constant reminder of the day they made the front page. 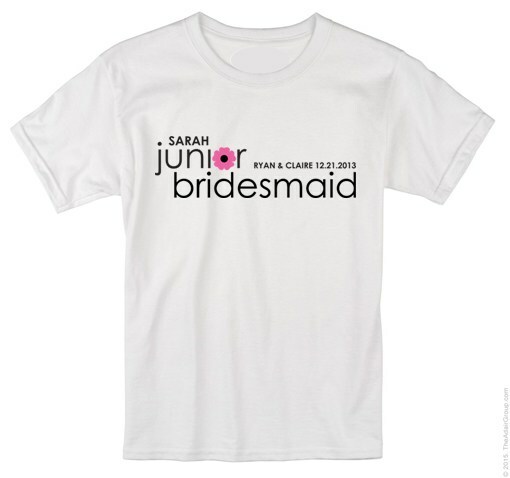 In addition to these really stunning wedding newspaper favours, NewsFavor.com prints a range of newspapers for all occasions, including baby birth announcements, and birthday newspapers. 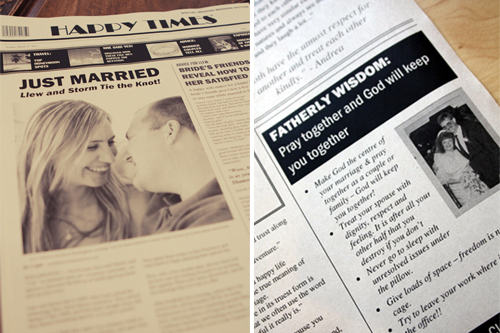 If you would like to find out more on how to order your own custom made newspaper, contact NewsFavor.com for a personalized quote.